At Fazeley Junction where the Coventry canal meets the Birmingham & Fazeley canal we moored up and I went inside the British Waterways offices to have my name added to the boat registration. It was the final item we needed to address in order to consolidate our earthly goods in order to satisfy the UK Border Agency for the following round of hoops awaiting us in twenty one month's time. As I was explaining our circumstances--how we met, fell in love, married in the states, needed to merge our belongings to provide proof to the border agency that we are indeed living together as husband and wife, etc., etc., my eyes fell on plastic wrapped parcels of the most recent Towpath Talk. I tore one open, grabbed three copies, opened one to page 92 and told the BW personnel, "Look! This is us," pointing to the Wet Web column by Helen Gazely which featured a small bit about me and Les and our romance. How satisfying that was!! Many thanks to Helen for featuring us. Yesterday afternoon we stopped at Fradley Junction for water, tipped the rubbish, and washed down the NB Valerie. Then Les turned left at the junction onto the Trent & Mersey canal. This is all new territory for me. The locks we are moving through now are single, deep locks which I much prefer to the large double locks on the Grand Union. We cruised for another hour and a half, passing Mal Edwards MBE, maker of fenders and one of the many characters that have befriended Dear Sir along his travels. He and Mal cruised together for awhile when Les first started living aboard. Up in Wales they frequented pubs on music nights as Mal plays the squeezebox. Les recalls brilliant evenings filled with good craic. Les slowed the boat and chatted with Mal for a a short bit, introducing me as his wife, which brought a keen look from Mr. Edwards. He said he would see us up on the Llanny (the Llongollen Canal) and we waved goodbye. Shortly after NB Valerie was moored in late afternoon on a wooded stretch some ways past Kings Bromley Marina. It is a lovely quiet spot, with a large field across the canal on the offside. Later as we prepared for bed, Les and I looked out the window upon an enchanted night. There were so many stars in the sky, the trees seemed spangled with them; the quarter moon hung low, like a wine skin spilling liquid light across the dark water which barely rippled from a warm breeze. Owls called to each other across the midnight woods, lulling us to slumber. I woke just before dawn this morning to a chorus of birds serenading me back to the world from a sleep of strange dreams. I lay there listening in delight and wonder: who orchestrates the birds so each particular song can be heard above the other? The world is a place of wonder and I am immensely grateful for my place in it, tucked warmly under the quilt next to my beloved. Labels: British Waterways, Fradley Junction, Frazely Junction, Kings Bromley Marina, Owls, true love. We had been tipped off by friends Paul and Jenny who were ahead of us that a large amount of tree felling had taken place. This was one of 3 possible pictures i could have taken along the short stretch opposite Valley cruisers base by bridge 27. So an overnight stop or two was all that was needed to replenish our stocks as you can see below. We spent 2 days here cutting and splitting between the rain showers but decided against a 3rd nights stay as the number of motorcycles going past grew by the hour. The towpath became a mud bath and we moved on quite late in the day at 4pm just to find some peace and quiet. Just think if the bikes had been past your house you would not have the solution we had......move. Jo and Keith on Nb Hadar stopped by on their way north for a chat which gave Jaq a chance to reduce the list of bloggers she is so looking forward to meeting. Those with home ovens can bake it in a Bundt pan and forgo filling and frosting. The large, round Bundt cake slices are so moist and delicious, frosting is overkill. For those of you who cook in a tiny boat oven, you will have better success baking this cake in two 8 or 9 inch round pans. And since one must open the oven every twenty minutes to change pans from one rack to another and move the cake pan around to keep one side from burning and the other side from under-cooking, it is likely you will be faced with two cake rounds that rise...and then fall. No matter, filling in between the layers with seedless raspberry jam and frosting the top and sides with chocolate Ganache covers a multitude of sins...and makes this cake extra special! Grease and flour your cake pan(s). Preheat the oven to 350F (Gas Mark 4). Mix the first five ingredients together in a large mixing bowl with an electric hand mixer or by hand with a balloon whip for three minutes. Once all the dry ingredients are well incorporated, add in the sour cream. Mix well. Fold in the chocolate chips with a large wooden spoon and pour batter into cake pan(s). For conventional home bakers using a Bundt pan, and bake for 55 minutes. Remove from oven. After 10 minutes remove cake from Bundt pan by inverting onto plate. Serve slightly warm. Delish!! For boat oven bakers, bake for twenty minutes, then switch cake pans from lower to upper oven rack and vice versa. After fifteen more minutes turn pans so cake bakes evenly. Often one cake will cook faster than the other. You know your oven so...test your cakes by inserting a toothpick in the middle. Bring the double cream to a gentle boil, stirring continuously. Once it begins to boil. Remove cream from the heat, and add in the squares of chocolate. Stir continuously until the chocolate squares are melted and incorporated fully into the cream. ( This is basic Ganache, which can be refrigerated and used to make Truffles.) Add in the vanilla, salt, and golden Syrup, and brandy. stir to mix and set aside in fridge. It can take up to 55 minutes for the cake pan on the bottom rack to finish cooking. Sometimes the top of the cake is a little burned around the very edges. Not to worry! cool both layers completely. Invert one onto a plate. Spread the top with Duerr's Seedless raspberry jam. Be generous. Invert the second layer on top of the first. Frost top and sides with cooled Ganache. Enjoy! This cake gets better with time--if it lasts that long! It also freezes, unfrosted, quite well. In days past I've often made it in a bundt pan, cut it in half when it had cooled, and froze half the cake for up to three months. A word about using good ingredients: Les in his batchelor mode assumes chocolate is chocolate and brandy is brandy, etc. "Cheap and cheerful" that's his batchelor mode of thinking. I made Ganache with Tescos' cheap chocolate and then made another batch with Green & Black. His palate is now educated to taste the difference. So if you are going to the trouble of making this cake...use top quality ingredients. You are worth it and so are all the people who will queue up at your door when they find out you made this cake! Reading through the blogs i came across a post on Hadars blog in which Jo and keith show what BW must have done following my phone call. Well there we were cruising through Nuneaton having just stopped to buy a pot of cream (I will tell you later), Jaq was down below(later) when it happened. The front of the boat lifted and I immediately went into neutral and heard a scraping as the bow went back and the stern rose. Looking back a burnt out cruiser popped up or at least the hull did. I phoned BW to report it using the Head office number 01923 201120 as this is no charge on my mobile (cellphone). The alternatives are 0845 6715530 or 0800 4799947 both chargeable on most phones. Why BW can`t provide normal land line numbers is beyond me, the one they have 01923 is a nightmare to get an answer on. The site I usually use to get alternative numbers only has the ones i`ve quoted. Anyway I did report it but a few days later I was chatting to some BW guys who covered Nuneaton and they had heard nothing but said they would call their yard and get it sorted. Ok the stop for cream and the reason Jaq was down below is revealed below. It is Chocolate Kahlua cake and the Kahlua is a coffee liqueur. It is heavenly and perhaps Jaq might post the recipe in the near future if you ask her. Following some conversations between Helen Gazely of Towpath Talk and Jaq. 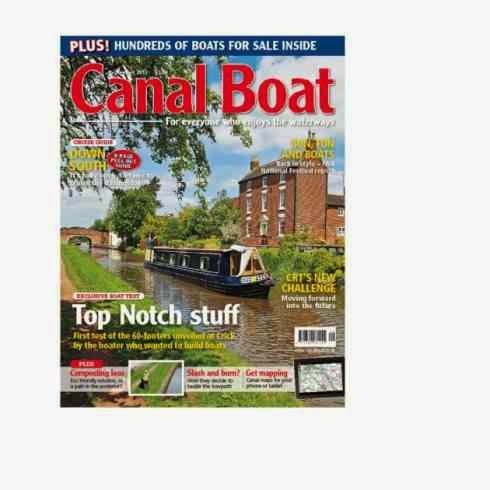 We now find ourselves featured in the March edition of Towpath Talk. Helen evidently reads a lot of blogs and liked our story. Not sure if the hard copy is in the boatyards yet but you can view it here online. Just put in 92 in the page box and hit enter. So nice to get moving again although the freeze came late this year at least it only lasted 17 days. Last year I was stuck at Newbold for 7 weeks. So with the diesel tank topped up and a few more bags of coal on the roof we set off in search of wood as our supply had dwindled to 6/7 logs. We stopped the night at Brinklow as a late start and fueling up took it`s toll on the daylight. At least the Greyhound at Hawkesbury Jct. is surviving. It`s been there since the early 1800`s and is now Grade II listed. Moving on just a short distance and the Navigation is another casualty. I am inclined to think this pub will end up being demolished and housing taking it`s place. I just had to search, to much free time, and here it is a planning application. Please bear with me with the links as i am trying to help friends of Jaq and I in the USA who perhaps might be pleased to read more. For example our listed buildings here compare with U.S. historical listings and for sure a bar is not a pub. This particular post has been sitting around for a while(10days) and i never got around to posting it. Not sure why but perhaps i was thinking folk would get bored about me harping on about my passion of canal history. Anyway this is the final post of the Oxford and at the end are some links so you can investigate the past if you wish. Click images to enlarge. Well the weather is not looking good, the boat is held in an icy grip with no sign of a thaw. The good thing is this enforced stoppage has given me time to find the old route of the Nth. Oxford by studying old maps at the library and walking the old route where possible. Walking up the Brownsover Arm is easy as a lot is still in water, and I did this some time back, but the return to the main line is mostly under an industrial estate but looking in the right places still gives little clues of the route. This time my interest was the route the old line took after the Rugby Wharf arm`s present terminus. I have been using some old maps on line from this site and then using the old ordnance survey maps and microfiche at the library. The pictures above and below are the same area, and if you have ever travelled by bus into Rugby from Newbold village the bus would have come down Newbold road in the bottom left of the picture below. B. The present terminus of the Rugby Wharf arm. (Willow Wren base). The black dotted line is the old line on it`s way to join the present canal by the Quarry. Along Foster road the canal bed is still there. C. Main line entrance to Ruby Wharf and winding hole. The line heading off the page here is the route of the old line coming from Brownsover via Cosford village. I have photocopy of a map dated 1828 titled `Intended improvements to the line of the existing Oxford canal`. It shows the old route snaking across fields as it followed the land contours and the proposed new route in bold. In case anyone wants to look, Rugby library has it under lock and key in the transport section of the map cabinet. Now a combination of this map, a map dated 1947 and modern day maps the route can be traced quite easily. An online map i found useful can be found HERE and you can click on the drop down box to 19th century. Also online HERE is the wording of the act of Parliament to do the straightening. Page 504 lists the new sections to be cut including one to join the Oxford canal at Joseph Astell`s garden in Ansty. Page 507 then lists the sections to be dis-continued following these new cuts being completed. The place names listed are mostly un-familiar until you go searching old maps you can then seek out the site and find the old route most of the time albeit in some cases very overgrown. Google earth is also good as even when a canal has been filled in by farming there are still scars visible from above. Since we've been frozen here at Newbold-on-Avon I've been enjoying a daily walk through Saint Botolph's churchyard which leads on--just past the church cemetery--to a public footpath through a huge field with 19 old oak trees planted side by side down the middle. From there the canal traveled adjacent to the cemetery and gently wrapped around the back end of it ﻿﻿before veering off around a curve, and disappearing from view into what is now the bottom of the very large field with the Oak walk, meandering onward towards Hawksbury Junction and the Coventry canal. It is a thoughtful journey indeed which takes one past seven hundred years of the local dead and their magnificently carved gravestones. I notice there are nine new graves in the cemetery since we we were here last May. I first stopped in this churchyard last spring on my two week visit to England. Newbold is a boater's village with the canal passing right by its two pubs--the Barley Mow and The Boat. Before it was straightened, the old Oxford canal used to pass through what is now the the parking lot of the pubs, mere feet from their doors. Cutting straight through, it flowed out to what is now the Main Street, crossed over and passed across the front of Saint Botolphs, curving right 'round it on the right where there is still an old brick canal bridge in site of the churchyard. Last week I found myself walking through the cemetery on a very dark and misty afternoon and I laughed, thinking about all the ghost stories and films set over the years in such atmospheric places. I found it peaceful, pleasant and restful. Local folks often come to the graveyard of St. Botolph's to sit on a bench under an ancient Oak or Cedar, dappled in shade and set amongst mossy ground, with centuries of their forbears and neighbors with whom to keep company. There is a children's grave walk which looks out over the hedge to the old canal bed. I walked the paved path which meanders past thirty two gravestones, marveling that only four had not been well kept. All along the lane of small graves, flowers, toys, and mementos are tucked neatly alongside headstones shaped like hearts, crosses, and tablets. One has a teddy bear peeking over the top; others are guarded by angels cut from stone. The first one belongs to Courtney, nicknamed Princess Boo, ten years old when she died. Her grave is enclosed with white planters filled with delicate silk roses and pink net butterflies. A tiny pink dragonfly wind charm is attached to the large Holly tree which shelters Courtney's grave. It tinkles delicately in the breeze; the wind ruffles the flowers, flutters the butterfly, and spins a pinwheel. A small white lantern tosses from another tree branch, placed there no doubt by her parents, who couldn't bear to leave the body of their child lying in the dark. Les and I perused an old Oxford canal map dated 1828 which we found with the help of the Rugby librarian. We noticed a farm just near St. Botolph's called Widow Norman's Farm which the old Oxford canal route encircled as it traveled away from the church; a bridge on the farm road over the old canal was called Widow Norman's bridge. Current maps indicate the widow's farm corresponds to Badger Lodge--still a farm, although the bridge is no longer there since the canal was straightened. On one of my churchyard forays into the older stones located near the front of the Norman towered church, I came across several very old headstones and two large above ground crypts. A nearby headstone tilting into the loamy green of the yard with barely discernible curlicued chiseling reads, "John Norman Senior of Newbold, died Feb. 13th, 174 and 3/4th." This strange date is due to "a change in the calendar in the eighteenth century," according to the web page describing Saint Botolph's. (http://www.stbotolphstjohn.org.uk/stbotolphshistory.htmhttp://www.stbotolphstjohn.org.uk/stbotolphshistory.htm, accessed 02/14/2012.) "By one system February 13th was 1743 and by another it was 1744." The oldest crypt standing above ground near the priest's door to the church is inscribed "Sacred to the memory of John Norman of Newbold, who passed in 1816 aged 63, and Ann Umber, his widow, born at Hunningham in 1797, died Bubbenhall, June 30th, 1859, age 90." Here lies widow Norman, after whom a farm and a bridge over the old canal were named. John's spinster sister Jane, age 63, is also interred in the crypt, having passed on November 12th, 1826--a year midway through a decade which saw the English countryside ravished by rolling epidemics of smallpox, fevers, and cholera. Les calls the gate from the churchyard to the Oak walk a "kissing gate" because only one person at a time can go through, after which the gate must be pushed back to allow the next person access. He always goes first, then turns and kisses me over the top of the gate. We walk along the path past the old canal bed, flanked on either side by old gnarled oaks while the tops of old gravestones peek over the hedges. Bricked up tunnel of the Old Oxford Canal. May it R.I.P. A year ago i proposed to Jaq so to all you ladies out there looking for love, don`t give up. After 11yrs on my own I can safely say I have found true love. memory serves me well at the time I needed water then the snow had stopped the buses running. This time my lovely wife located everything we needed in Coventry and the buses were running. So a cup of tea between trips to the tap and the tank has been slowly filling as we, Jaq has taken her turn, put in more each day than we use. This afternoon a hire boat from Rose at Stretton cut it`s way through the ice. Just how far they intend to go i`m not sure but it might help boats further along to make a move if stuck away from services. Seeing the thickness of the ice broken by the hire boat i`m inclined to wait a few more days before moving. The temps. are rising so with luck the ice will rapidly disappear. We have the Barley Mow,with food, beer and Pool just 3 minutes away. Jaq loves our pubs. A few days ago we went into Rugby and popped into Weatherspoons for lunch. It was Steak club day and the price of under £7 ($10) with a drink--be it coffee, beer or a shot of gin--was a bargain and we both thought the steak was good. During our enforced stay we have conducted a food survey with the local Moorhens. Latest figures show that they like beetroot, tangerines, tomatoes. Leftover meatloaf providing the gulls are not around was also quickly pounced upon. the pubs has always﻿ been a mystery. Out walking, I got in conversation with a man living opposite the church and he had a photograph of the above picture, the original of which hangs in the St. Botolphs. I have read somewhere the tunnel was 125yds long and this would put the mouth about the middle of the road dead centre of the picture. I paced out across the subsided grass the other side of the hedge to get the direction and distance. The other tunnel mouth is just about where the tall tree to the right of the church tower is. Standing where i took the picture it all looks to much of a hill for a canal route but in 1790ish the geography was a lot different. Hope if anyone has tried Jaq`s triple caramel cake it went well. All i can say is mine has all gone and i am now into a spice cake with cream cheese frosting. All Jaq`s wonderful cooking is made from scratch and tastes divine. Yesterday Jaq had me peeling Cardamom pods to use the seeds, after grinding, to flavour the spice cake. Ok enough of that side of the blog but the afternoon cuppa and cake tasted so good I felt the need to mention it. I've spent the better part of six months baking approximately twice a week in order to figure out how to cook in the itsy-bitsy-teenie-weenie boat oven. 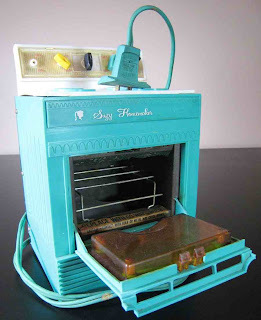 Unfortunately for me, I was not a child recipient of a Suzie Homemaker Oven for Christmas, which every little American girl was purported to desire in the 1950's. The toy oven was heated by a regular household light bulb and came with its own tiny set of baking pans and mixes. After much trial and error I've found I have the best results with cakes turning out when I use two nine inch silicone cake pans. I also turn the oven up one gas mark higher than the recipe calls for on the advice of our friend Tina E. who has lived aboard and cooked daily for years. I find it necessary to switch the cake pans from the top rack to the bottom--and vice versa about every twenty minutes, and I also turn the cake pans half way 'round each time I switch racks. It generally takes a bit longer than the recipe indicates, so what was once a "whack-it-together-and-bung-it-in-the-oven, turn-on-the-timer-and-walk-away-for-awhile" exercise, resulting in a lovely, high rising, tender-crumbed cake is now an act of intense cake sitting. You know, like babysitting only no diapers are involved. Anyway since I live on a boat and work when I want, I have plenty of time on my hands so it all works out. 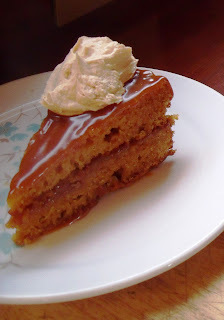 Here without further flourish, is my Triple Caramel Cake recipe adapted for boaters. If you do not live on a boat and you would like the original non-boater's recipe please email me and I will send it to you. I hope you enjoy it. Big Daddy Bear ate ours all up! 12 Tablespoons of unsalted butter at room temp. Pour two cups of cream into a medium saucepan and slowly bring to a boil. Lower the heat and keep at a bare simmer. Stir frequently. Place 1 cup of sugar in a heavy bottomed saucepan over medium heat. Leave undisturbed until the sugar begins to melt and darken. Gently shake the pan to distribute the sugar and to keep the melted sugar from burning. When all the sugar has melted and the caramel is a very dark amber, remove from the heat. Carefully add the hot cream a little at a time as it froths and bubbles up and can easily go over the pan or splash you. Stir constantly with a wooden spoon as you add the cream. Don't worry if the caramel hardens, It will melt as the sauce boils. Return the pan to the heat and keep the sauce at a gentle boil for about five minutes, stirring constantly. Set aside for about thirty minutes, stirring often, until the sauce is cool. Measure out one cup of caramel for the cake mix and set the rest aside. NOTE: I added a 1/4 tsp. of vanilla extract, a generous pinch of salt, and a wee bit of Martells brandy to my caramel sauce. I find this gives the sauce depth. Heat the oven to 350F (Gas mark 4). Butter and flour a Bundt pan. With an electric mixer, cream the butter and remaining 1 1/2 cups of sugar until fluffy. Add the eggs, one at a time, waiting until each is incorporated before adding the next one. Gently but thoroughly fold the dry ingredients into the butter-sugar-eggs mixture alternately with the 1 cup of caramel sauce, beginning and ending with the dry ingredients. Pour the batter into the prepared pans and bake until a skewer comes out clean at 30-40 minutes. Set on a rack for about 10 minutes and let cool and then un-mold and cool completely. When the cake is cool set a half cup of the remaining caramel sauce aside. Drizzle the cake with a half cup of caramel sauce letting it run down both sides of the cake. Whip the remaining 1 cup of cream until medium soft peaks form--do not over whip! Gently fold in the last half cup caramel. Top each cake slice with caramel cream before serving. Please note--the following is an edit for British bakers with cups converted to ounces per request of Sue. Here you go! A year ago today Dear Sir landed in Pullman, Washington, USA and bussed me softly on the lips inside the tiny regional airport. It was also one year ago we had our first personal assignation after three months of near daily phone calls that lasted as long as five hours! Thank the Goddess for PennyTalk.com which kept us from going bankrupt in order to stay connected across the Atlantic those dark, cold, and lonely months filled with anticipation and longing. After nearly eight months of marriage we know we are each other's best mates. We are tailor made for one another. Les is a lovely human being: warm, kind, sensuous, side splittingly funny, with a generous soul and heaps of patience. It has not always been an easy adjustment living abroad and living on board. There are a few American things I miss, and I often fail to understand the British outlook and ways of doing things. For example, why use five words when two will do? Invariably the British use a string of words to attempt description of something an American will communicate in far less. I was in the public loo at Sainsbury's last week and inside was a baby changing station--which is what it is called in the States. Here in England this unit is labeled "Baby Nappy Changing Station," as though one needed clarity on why such a thing specifically exists. As if to say without actually doing so..."This unit is intended for small babies who need their nappies changed. Please do not attempt to change Nanny's ©Depends Adult diaper on this station." Another example is the actual name of a local grocery store chain's "Extremely Strong Extra Mature Cheddar Cheese." I had no idea a string of adverbs and adjectives could actually be an official part of the name of a grocery item. Who knew??? Not us Yanks. We have four choices in cheese strength back home: mild, medium, sharp, extra sharp (aged over 18 months). As I close for the evening it is snowing outside and a large coal fire is burning deep orange in the stove. We are officially frozen in at Newbold, and while this is a very good spot with close access to water, coal, diesel, groceries, and a bus to Rugby, we are still antsy; hoping for a quick thaw soon so we can be on our way toward Wales and the LLangollen. We aren't in any hurry, but we don't like being pinned down in one place for too long. May the Goddess and the five sacred things (earth, air, fire, water, spirit) hear my prayer for a brief cold snap followed by lashings of mild weather. This is the view this morning. The path through the ice we took yesterday has frozen over and a light coating of snow has survived all day and forms the foundation of what could be a thicker ice barrier holding us prisoner. So glad we took the opportunity yesterday to get on board fuel and water. The ice is not to thick but enough to damage the blacking and make steering difficult enough for us to stay put for a few days. I hope everyone likes the new blog layout. 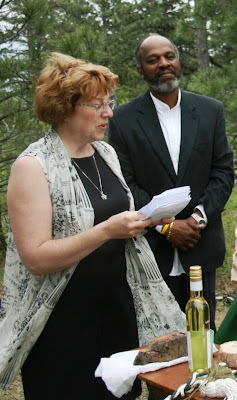 It had been my intention from before Jaq and I started life afloat for both of us to share the blog. In the early days Jaq was doing "So This is Love" and then went on to "From Where I Sit." Now I would guess a lot of you fellow retirees will agree that there seems to be a lack of hours in the day at times and we wonder how anything got done when holding down a job. Jaq does do a few hours on line teaching writing to students via Washington Sate University but even after cutting this down a tad still never found time to do her blog. 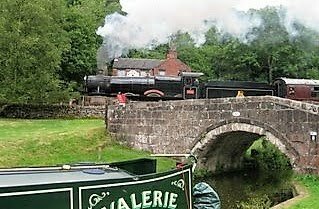 My suggestion was to make Nb Valerie a joint blog as the posts do not need to be of great length like her own blog, so will not be too demanding of her time. Writers write, it`s what comes naturally but Jaq agrees boat blogs need to be a shorter length so another loving partnership has evolved, welcome to our blog. Not sure how it will go but evidently Jaq will be putting on the odd recipe so I won`t say anything about the caramel cake I am scoffing as I type other than yummy!!!!!!!! A very misty morning as we passed Barby marina. I have read a lot on the Internet of people paying in advance for moorings only to arrive and find the facilities promised were not available. As perhaps this might end up as a legal battle I will not say anymore other than as the camera shows, unfinished pontoons and boats moored packed together. I suppose it will all be sorted out eventually. Not sure of your thoughts but I`m of the opinion that new marinas are far outpacing the number of boats coming on the water. Today the ice is still around and with temperatures set to drop over the next few days the sight of this boat crashing through the ice this morning was enough to cast off the ropes and move up to a very frozen water point. A kettle of hot water and the tap flowed; our tank filling, my wife and I (I love saying that!) over breakfast decided to get diesel and top up the coal stocks. So off we went to Lime Farm marina following the wet road through the ice left by the early morning boater. No sign of life when we arrived so kettle on while we waited and after a while Sarah returned on horseback having taking advantage of a quiet spell on the canal. No rush. It`s the life. So now we are back at Newbold all stocked up for a few days while the weather makes it`s move. After months of attempting a new boat blog on my own and finding little time to blog while adjusting to a new country and a new life as part of a boating duo, Les and I decided to retool his boater's blog to include us both. We hope you will like the new look and contunue to follow along on our journeys. 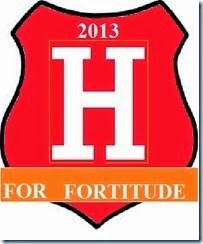 I will now be blogging here as well in an attempt to keep all my peeps back in the States informed of where we are. Having sent out a dozen Inland Waterways maps to my nearest and dearest, I've been asked to keep them posted on a blog. I will also include my brief impressions of things seen, heard, and experienced aboard NB Valerie, incidental anecdotes about living in England as an ex-pat, and recipes for some of our favorite meals --adapted for boaters with small boat ovens! Today we are moored at Newbold-on-Avon, on the N. Oxford canal just North of Rugby next to Newbold tunnel. We will stay here a few more days as ice has formed on the canal during the night with temperatures at 32F/0C overnight.